There’s a place of Japan that’s not only intense, but bizarre and extremely stimulant. If you’ve been dying to dive deep into a very strange side of the Japanese culture with performances filled by ninjas, dragons, neon lights and lasers – you’ve come to the right page. Get ready to mark this location on your bucket list. Before arriving it’s highly recommended to reserve your tickets online through the Robot Restaurants official website without any cost. 💻📱 Select how many will be attending and function you’d like to watch. Keep in mind that the earliest function is the only one allowing you to take pictures with the performers. Once having completed your reservation you’ll receive a code in your email. Screenshot or print it out your voucher but make sure to have it with you. Do not look for any website to find tickets on sale as you’ll become an easy target for scamming. If you arrive without having reserved to purchase your tickets in advance you may be unlucky enough to not obtain seating. 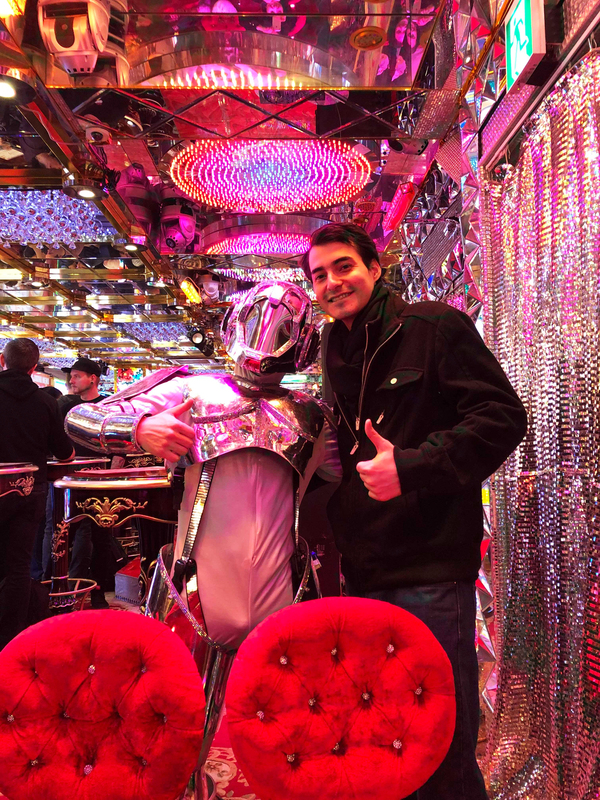 Once you arrive close to the area you’ll undoubtedly find signs leading towards Robot Restaurant but there are so many signs you’ll hopefully not get confused on the way. If not, just ask anyone in the area, they will of course know where it is and hopefully be kind enough to walk you there (as a woman did for me). On the way there your noise will catch the smell freshly cooked tempura and fried rice. Do you hear that? 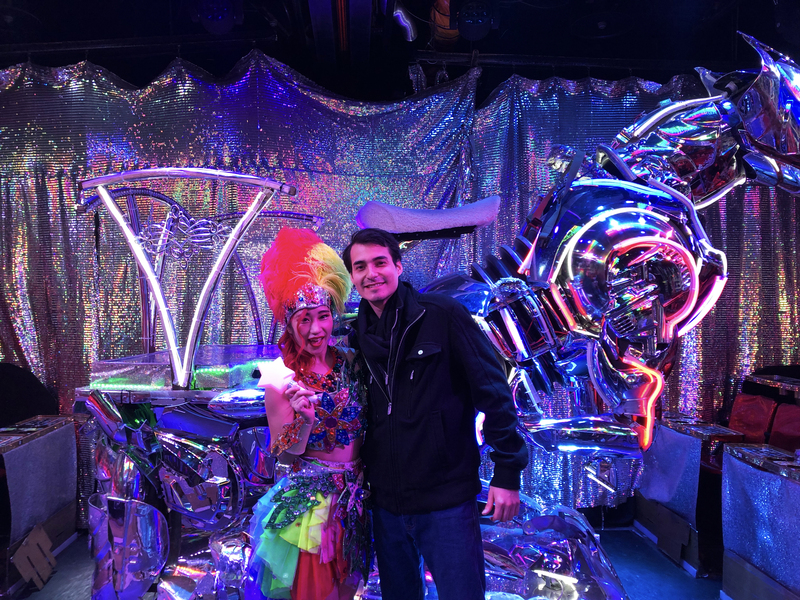 It sounds like music… just follow it and you’ll come across the Robot Restaurant that occupies two buildings on either side of the street. One is used for purchasing tickets and the other opposite is the entrance to the show through an elevator. If you get confused there are a handful of staff members around ready to assist. 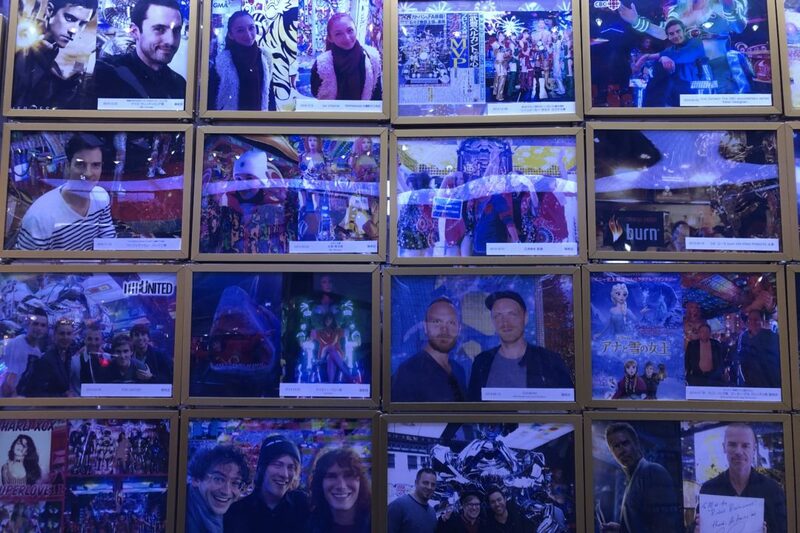 Not one centimeter of the entire building isn’t covered with glitter, brightly colored lights, metallic paint, and other visual stimulants that’ll attract any wandering eyes. It’s a full on sensory explosion overload with moving rainbows, loud sounds, flashing lights and shiny surfaces that never stop to get enjoyable once you’ve become a part of it. A staff member will ask for your voucher code to let you in. Go inside to purchase the tickets at the counter. 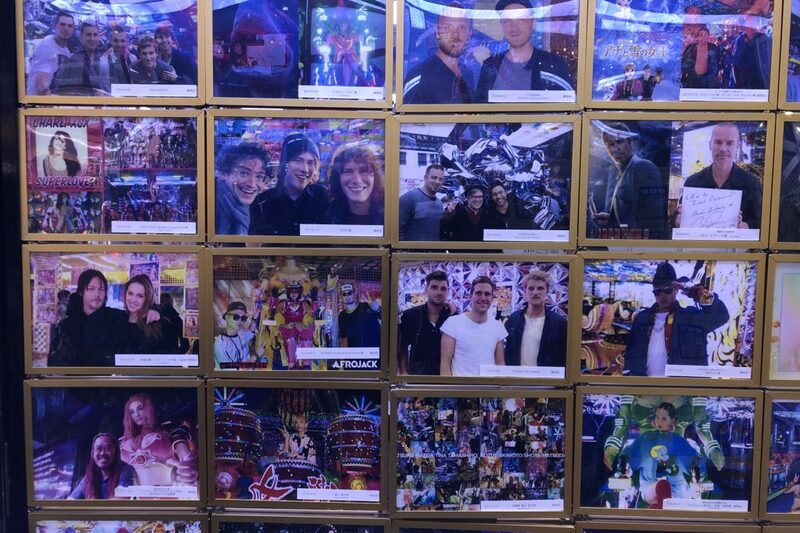 You can notice on the side of the wall the famous celebrities that have visited from around the world. After having bought your tickets, the entrance is opposite of the counter where there are large robotic statues to take pictures in front of. You’ll enter an elevator and be taken upstairs to the main lobby where there’s furniture to sit and beverages that can be purchased. As the doors slide open you’ll walk in to notice a robot dressed similar to the French electronic duo, Daft Punk, playing piano. For people craving a cigarette, there is a closed area right next to the area. The odor can be rather strong as the smoke accumulates in the room and exits whenever someone opens and closes the door. Certainly the most trippiest elevator created. You’ll hear the announcers notifying through the speakers when the shows is about to begin. Once the robot performer to end his shift you’ll be ushered downstairs to the basement where the main performance takes place. Before leaving, I was lucky enough to have received a photograph with the musician. Hopefully you might get the opportunity to take a picture with Mr. Roboto as well. Once the show is about to commence everyone will be escorted down three flights of stairs through very narrow corridors that are bothersome and a little claustrophobic to transverse. You’ll get distracted by noticing many types of objects and designs elaborated on every surface, each one being exceptionally vibrant. Once you’ve arrived to the bottom taken to your seat and wait for the spectacle to commence! There are four (4) acts in total for each performance. The first act lasts around 15 minutes and is a compilation of live musical performances with drummers on floats and others on guitar or bass. Dragons blow smoke as large Daruma statues move around the center stage. Samurais with 2 foot long swords appear with dancers moving from all angles. Afterwards, a lucky contestant is presented with a free bowl of popcorn. The first intermission then starts and lasts for 10 minutes allowing people to go to the bathroom, purchase snacks, beverages and souvenirs that is place in the center. 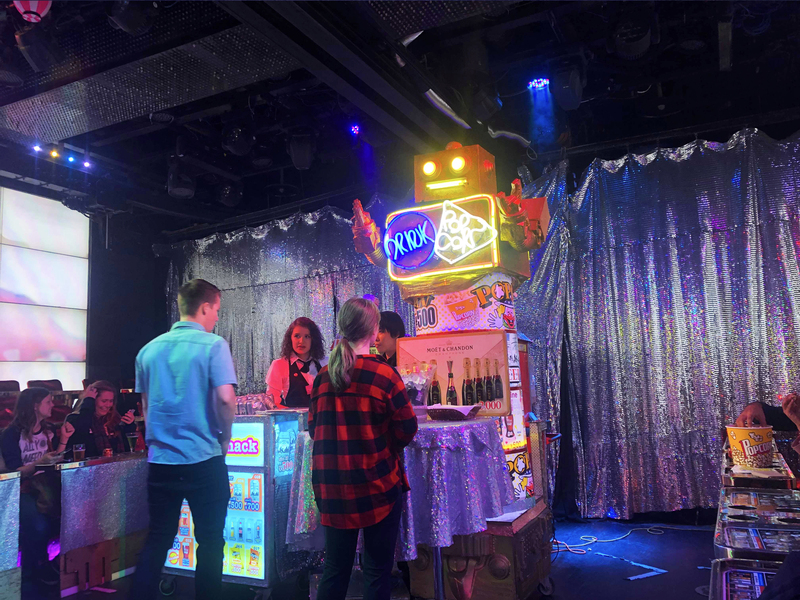 During the intermission before Act 2, barriers will be placed using steel poles and chains around the front row seats to help protect the audience members from the other large robots. The second act beings with a story displayed on each side of the large screens on either side of the room with a voice over explaining how humans and animals used to live in peace until technology and robots began to take over Earth. Woodland creatures and people dance around a flame until brightly colored robots that resemble Power Rangers appear carrying swords harassing the dancers. The second intermission occurs allowing people once more to purchase snacks and the last opportunity to use the restroom until after the show is finished. If you go and do not come back in time, you’ll miss the rest of the performance. The third act beings with performers dressed in black garbs with neon lights illuminating from their bodies. Remixed songs from Star Wards and Daft Punk are played while performance dance using strobe lights, fog machines and laser lightsabers to create an even more tantalizing visual effect. They find interesting ways to enhance the act by changing colors of lights and having robots appear. This is one of the most outstanding performances, however; it’s also the shortest. During the final intermission, each audience member is handed a different colored flow stick (some don’t seem to turn on) before moving onto the fourth act. The last portion of the performance involves a section dedicated to everyone dancing and singling along to intense J-Pop music and a weird rendition of Mark Ronson’s Uptown Funk ft. Bruno Mars. As the licensed songs are unoriginal – they diminish the quality of the show that was built up from the previous act. Large floats, vehicles from Tron, fish humanoids and of course, more robots emerge to join the dance until the show is over. If you’ve arrived that the earliest function, you’ll be able to take pictures with the performers and statues that just appeared on stage only for 5 minutes (make sure you reserve in advance to get that opportunity) before being asked to leave through the narrow flight of stairs towards the exit. 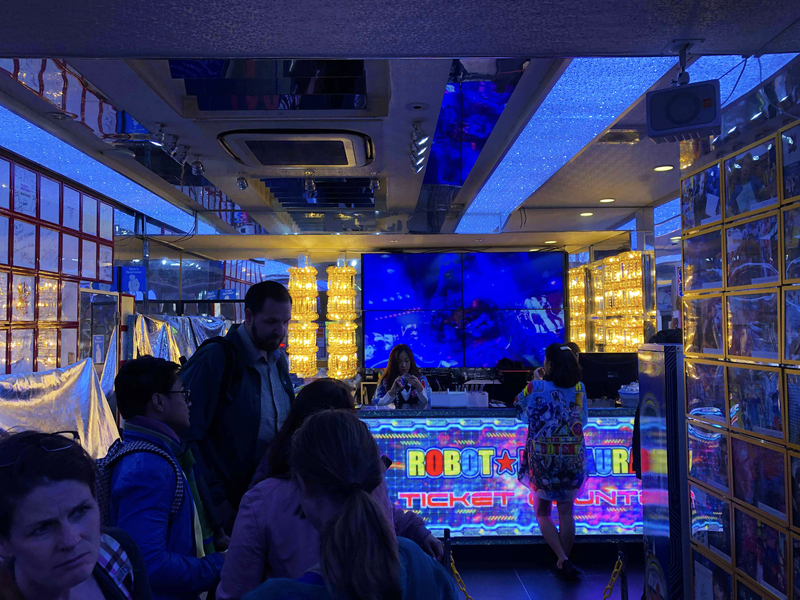 From the moment you walk towards the district, you are able to notice the publicity of Robot Restaurant on billboards plastered on almost every side of the street. You can find their information on Facebook and also through their website to purchase or view other information about their schedules and regulations before assisting. Even though all the pages of the website function properly, the visuals are poorly designed and outdated. The scripts for the stories aren’t well written but the whole performance is exhilarating and uses an over the top production of lighting. The amount of statues, performers and staff members available to assist and provide better service is impressive. Everything is well organized. Screens on either side of the scenario display CGI throughout every act that changes according to the performance. It’s a fantastic parade of a continuous light show that keeps increasing the intensity through every act until the end. There are dancers and musicians that give off lots of positive energy and play exceptionally well their instruments. It’s a shame that the costumes and robots look worn out. If you notice carefully you’ll easily see material torn, patches taped together, and paint chipped off. Some of the robots are controlled by remote controls and the few pilots just follow them without being enthusiastic about the performance. The use of licensed Disney material also makes it unappealing. Without a doubt, it’s definitely a nice excursion. If you’ve got the time and you’re staying in Japan of course we do recommend going to take a visit. You’ll get lost in all the wonderful lights, sounds and action of a Japanese anime! The performance focuses on stimulating as many of your senses as possible to create an exhilarating experience. 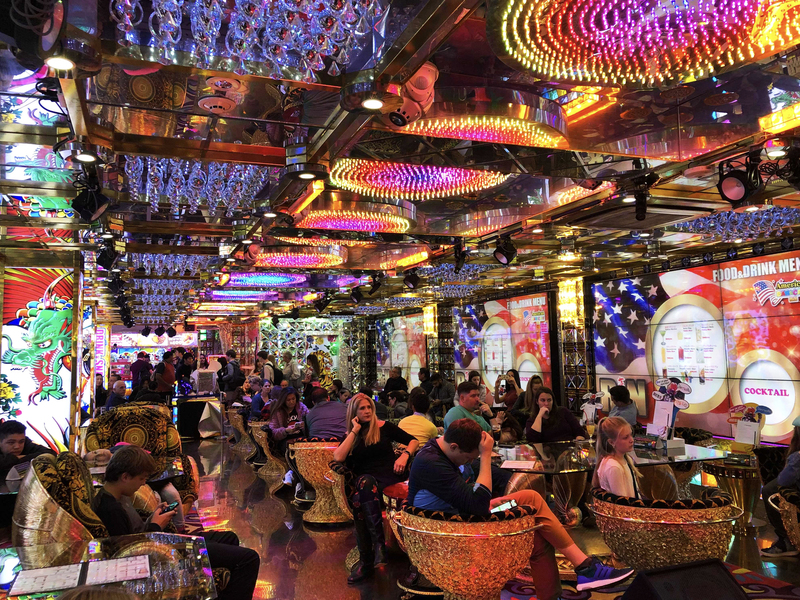 Whether the Robot Restaurant is worth your time depends on your interest. 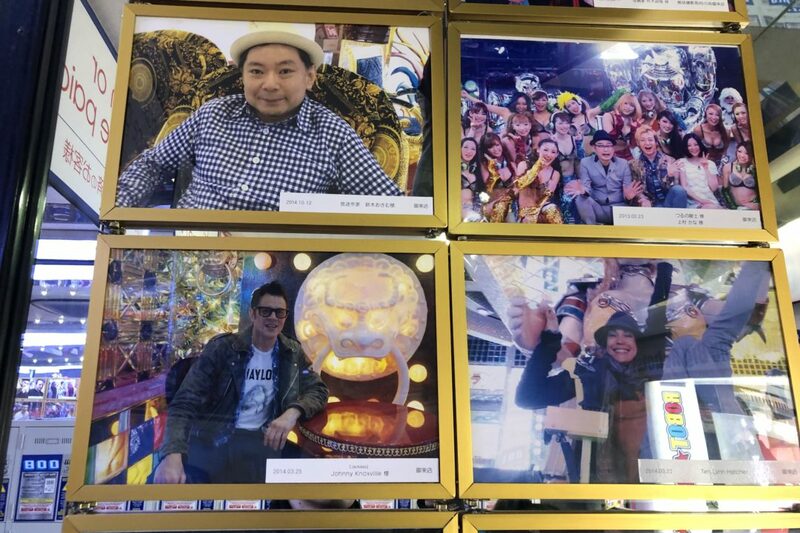 It’s a live Alice in Wonderland escape from the reality but if you’re looking for crazy over the top entertainment in Tokyo, this might be your place.